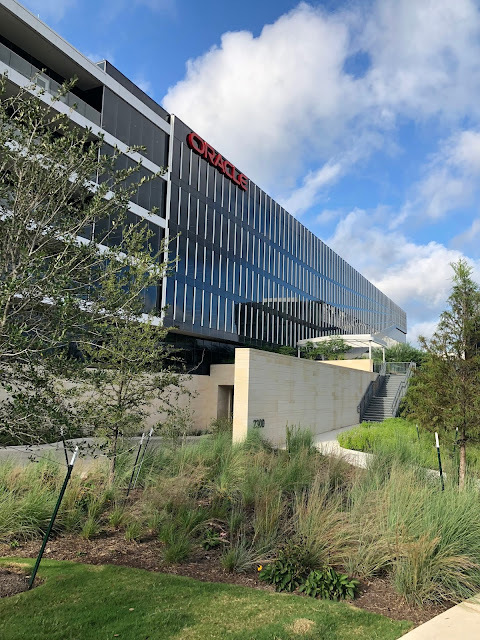 On Monday I flew down to Austin, Texas for a week of training and spending time with my Oracle teammates. Austin was quite a bit warmer than Minnesota. Weird how that works. I met up with my brother-in-law, Cliff Nelson, who lives in Austin. He told me we needed to go for some authentic Austin BBQ so he took me to Terry Black's. It was pretty darn good. We had beef brisket and sausage. Mmmm. Sausage. I've always heard about the bats that fly out from under the bridge near downtown Austin, so I asked Cliff if we could do this while I was in town. He was happy to oblige. We stood on the bridge through sunset and then started seeing flashes of the bats whizzing out from under the bridge beneath us. There were tons of tour boats and people on kayaks below in the water to watch the bats wake up and hit the town. They were much smaller than I thought they would be, but there had to be thousands of them flying around. Kind of creepy, but I never saw any come near us. After the bat show, we went downtown to Pete's Dueling Piano Bar. Naturally I made a request and told them it was Cliff's birthday. I thought it was funny when they called him out and had the whole place sing Happy Birthday to him even though it wasn't his birthday. My prank backfired on me when later in the evening they called up the birthday boy and his friend to have a dance-off competition in front of the whole bar. It actually ended up being pretty fun. Lucky for us, we can dance like madmen! 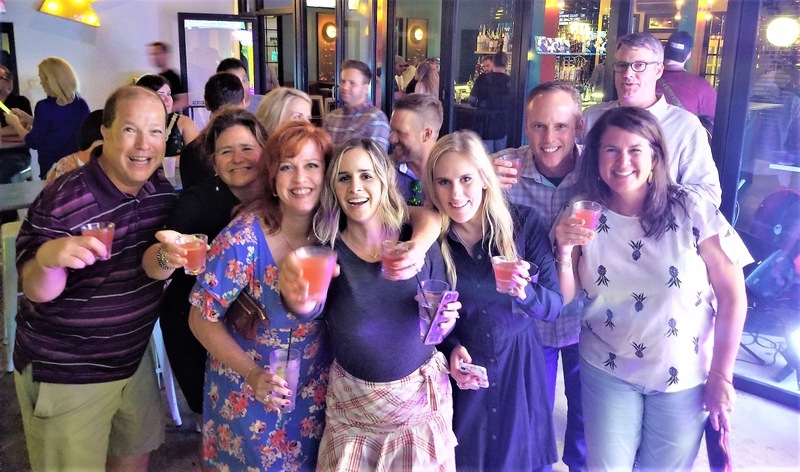 The next morning, I went to the Austin campus to meet some of my teammates and attend a couple of days of sales training. This place is amazing! It just opened early this year. Oracle spent more than $300 million and has created one of our most impressive innovation hubs. They're already building the next expansion and I heard they eventually plan on having more than 25,000 employees work here. This is me and several members of my sales team at Oracle. We worked hard during the days and played hard during the nights. They're a fun group of people. When I arrived back in Minnesota, I had one night at home before it was time to leave again. We headed to the St. Croix river for an overnight adventure to Treasure Island casino. It's become an annual tradition for us to end the summer with an overnight boat trip with Karl and Tina Zitzewitz. It was a bit chillier this year than year's past so we sealed up the boat while we made our way down the river for our 3 hour tour. I always love seeing the old railroad bridge. We saw a train go over it so we had to wait until that was gone and then the bridge-master lifts it up so we can make our way through to the other side. We saw an incredible amount of bald eagles on both our way there and back. We counted seeing at least 25 of them. Such majestic creatures. Our most unusual bald eagle sightings were when we saw two of them seemingly stuck in the water. There were also two more circling above them overhead. We scratched our heads trying to figure out what was going on. Eventually we did a google search about can bald eagles drown. It said there have been reports of bald eagles latching on to fish that are too large for them to carry. Sometimes in cold water they will hold on too long and eventually develop hypothermia and drown. Not sure if that is what was happening here, but it sure looked like it could have been a possibility. Hope the eagles made it out OK! I always enjoy seeing the monster barges. This one was going so slow and then we saw on it's banner that it was from a port in St. Louis, Missouri. That has to be a long trip! We saw several great blue herons on the trip. We also saw some pretty good blue herons as well. We had a fun night visiting Treasure Island casino eating at the buffet and playing some slots. We particularly enjoyed the Game of Thrones machine and the Brady Bunch one. Marcia, Marcia, Marcia! Both of our boys came home from college this week for different reasons. We love seeing them when they come home, even though it's usually for a short time. They usually need to re-stock on something or other and then get back on their way of being independent adults again. Blue sure likes seeing them. Luke came home for his quarterly trip to the Mayo Clinic to get his CT scan to keep an eye on the nodules on his liver. The doctor was somewhat concerned that although the nodules had been stable the past couple of times we looked at them, this scan revealed that they are starting to get a little bit bigger. He's not so concerned that he wants him to get another biopsy, but we are going to pull in his next CT scan by a month so we can just keep watching them and make sure they aren't going to turn into an issue. If you can keep Luke in your prayers or send him positive vibes if that's more your thing, we'd certainly appreciate it! 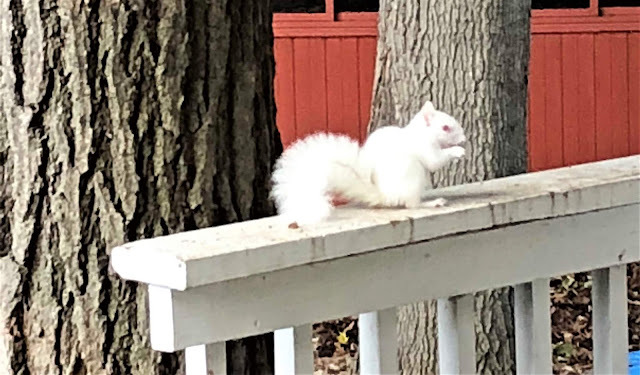 As if on cue, our friendly albino squirrels always seem to make an appearance when we are concerned with one of the boys medical situations. This little guy stopped by our porch every day this week. This has happened so many times to us over the years it really feels like it has to be more than just coincidences. In any case, they always give us a little peace of mind whenever we see them and help us to believe that things are going to turn out to be OK.